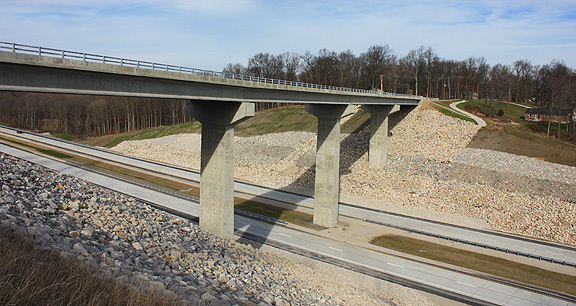 Project obstacles and solutions: The Harmony Road Bridge crosses over the new section of I-69 near Kirksville, Indiana. The bridge is a four-span, semi-integral structure. It spans 590 feet and rises over 92 feet above the interstate. The bridge was constructed with three cast-in-place concrete hammerhead piers and two end bents that supported precast 6 foot bulb T-beams. One of the biggest challenges on this project was getting concrete to the job site. The interstate was yet to be built and the access to the site was a muddy provisional road. The early work on the project called for mass concrete pours on the footings and piers. The footings were built 30 feet below the surface and attached to six-pronged steel shafts drilled into bedrock. Each pier was 16 feet long x nearly 8 feet wide. Each mass pour had a vertical height of 20 feet. The hammerhead pier caps were placed in a single pour. The piers were poured in the dead of winter when temperatures were dipping below zero. The concrete temperature of each mass pour was monitored. IMI QC/QA adjusted raw materials and hydration methods to keep the concrete cool at the core during these mass pours to prevent hydration heat cracking. IMI supplied a total of 2,100 yards of concrete for the Harmony Road Bridge. 700 yards were placed in mass concrete pours. The Harmony Road Bridge opened for traffic in October 2015. For more information on mass concrete, contact the sales representative for the location nearest you. Click here.